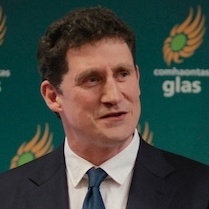 Eamon Ryan, leader of the Green Party, launched his bid to take a seat in the upcoming general election. Running in Dublin Bay South, the former Minister for Environment, Energy and Natural Resources stressed the huge contribution green politics can make in the next Dáil. He criticised the Government’s return to boom and bust economics, and called for a fundamental shift in the economic and political order. “We need our economy to be both competitive and collaborative if we are to address the inequality and insecurity we face. Our society must prepare for the long term changes and challenges that are taking place in the world. Economic growth should not be an end in itself. Rather, it must work towards creating a fair, sustainable, and just society. “We are delivering national policy that has a real effect locally. Policy that will deliver practical solutions in housing, transport, energy, food, and waste management, and improve the quality of all of our lives. “Policies like public banking, which removes profit from the lending equation, and instead provides a social dividend to local communities, or our vision for a revamped Irish Water, which puts conservation, fairness, and investment at the heart of the utility, and repealing the 8th amendment, an amendment which has proven to be disaster for Irish families, will all have a real, positive affect on our society. This entry was posted in Uncategorized on July 24, 2015 by ccdas.